One September morning (possibly yesterday) a little girl woke up not so little any more. 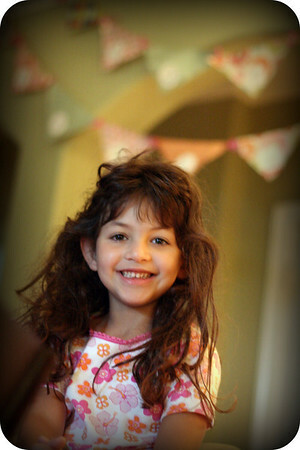 This little girl had magically turned six in the blink of an eye. Birthday Girl stumbled downstairs in her mismatched PJs and 80s rocker hair where her mama forced her to pose for pictures. Before breakfast. The nerve! The little girl exclaimed in delight when she glimpsed the birthday banner (recycled from last year) and the small stack of presents on the counter. Birthday Mama made Birthday Girl pose just like last year. Birthday Mama is not very original at 7:00 am. Armed with sugar cookies and birthday napkins, Birthday Girl skipped her way into school. It was destined to be a good day. After school (actually early release for Labor Day), Birthday Girl helped make her cake. She requested a Cookies & Cream cake, which was a repeat of her fourth birthday. We are nothing if not original. Notice though this year we made the cake in layers, you know, for something different. for a yummy supper, presents and of course, CAKE. This year the Birthday Fairy was a little stumped as far as presents go. Pappo and Grandma gave her a super cool big girl bike a couple of weeks ago as an early present (post on that to follow, someday). The Birthday Fairy can't wait to immerse her in all things American Girl, but realizes she is still a little too young for such a financial investment. So the cheap clever Birthday Fairy improvised. Meet Jane (actually her name is Sandie, but that didn't stick). 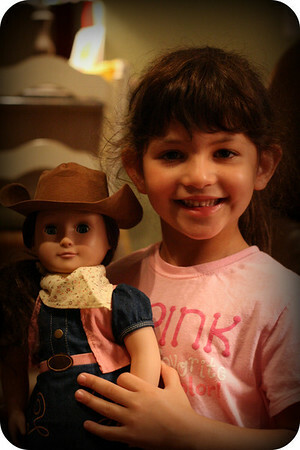 Thanks to the genius copycat Our Generation designers at TarJay, we have an Almost American Girl doll (AAG). The Birthday Fairy held her breath as Birthday Girl opened her gifts, waiting for the exclamation of, "This isn't Kit or Rebecca or Molly! What happened to the book? This is a knock-off! I've been ROBBED! ", but thankfully that didn't happen. Birthday Girl expressed her delight and immediately (well, as immediately as we could get everything snipped out of the disaster proof packaging) started changing her clothes and getting her ready for a slumber party. HUGE sigh of relief from the Birthday Fairy. A Buzzsaw Nerfblaster. Sadie and the cats quickly packed their bags and headed for cover. 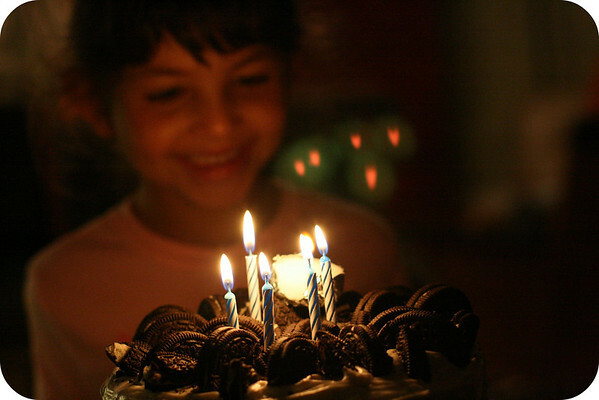 Finally, it was time to sing Happy Birthday and blow out the candles. What? You mean you see 5 normal birthday candles and one curious lump? Well, that's a tea light wrapped in foil to complete the necessary 6. The Birthday Fairy is nothing if not resourceful. The tea light makes the cake! What a special day for A. She must feel so loved! I love the idea of an AAG! 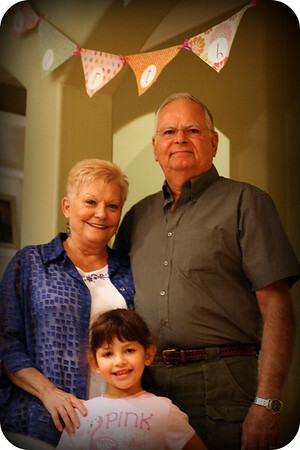 What a magical 6th birthday for sweet Annelise! The pictures are great and really capture the delight of the day. Happy Birthday precious Annelise! :) Love the twist on the cake! It is oh so yummy! And the AAG rocks!!! The BD Fairy did good. Happy birthday to your sweet girl! She's lucky to have such a creative and resourceful Birthday Fairy Mama! That cake looks delish! 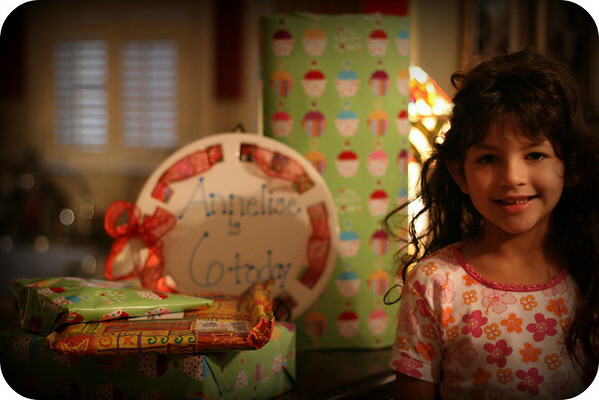 Happy Birthday, Annelise! 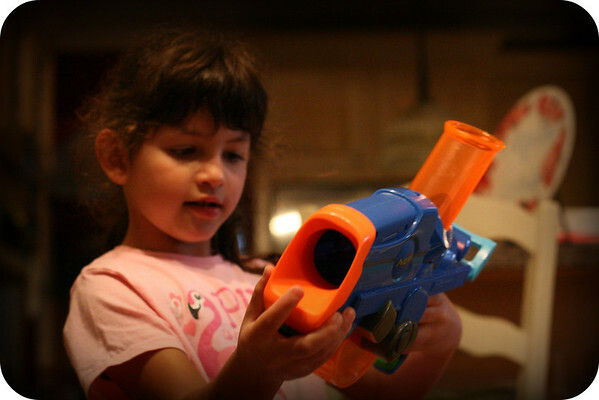 Go get 'em with your Nerfblaster! You have a great Mama! 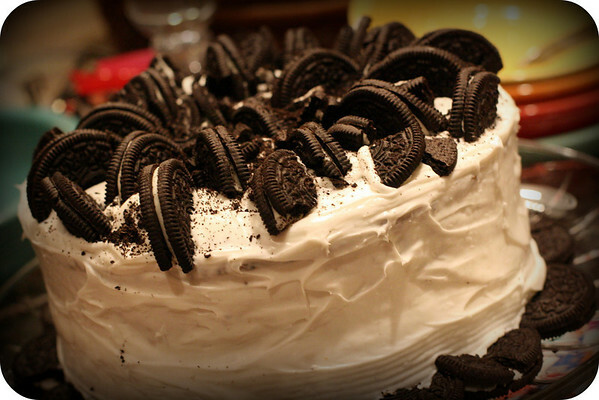 That Oreo cake looks worth the repeat!